In a business with just a handful of employees, it's easy for the manager to distinguish the worker bees from the drones. But as a business grows and adds staff members who no longer directly report to a single person, managing employee performance reviews becomes more complex. While large enterprises have long understood the benefits of managing human resources, the tools to do so can be expensive and difficult to set up and use for a small business. SuccessFactors is an online service, so there's no software to install. It includes templates and examples in an extensive library that helps someone who isn't an HR professional manage the performance review process. SuccessFactors will help a small business deal with its human resources in a more professional way. If your employees know that meeting business goals will directly affect their performance evaluations, they'll be more likely to keep those goals in mind when they do their work--thereby keeping your business growing. Setup of SuccessFactors involves providing details about each employee you wish to evaluate. The service walks you through setting up a goal plan and performance review cycle, then helps you use its templates to develop one that's right for your business. SuccessFactors even supports a "360-degree" evaluation, in which an employee is evaluated by peers, managers, and other colleagues. 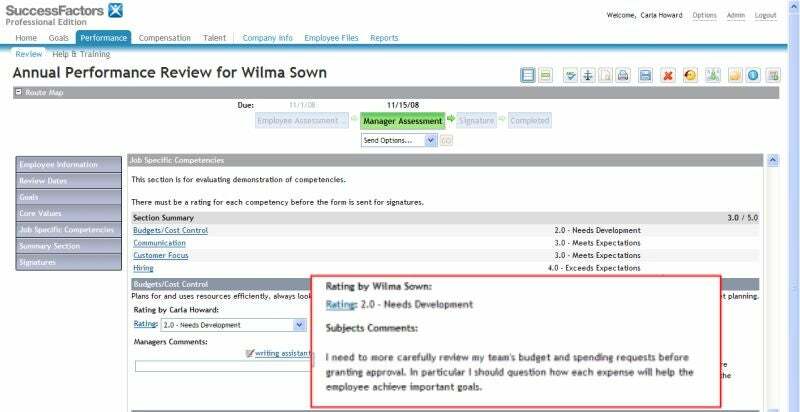 SuccessFactors' performance review service allows a manager to read an employee's self-assessment while preparing the ratings. Online tutorials provide general guidance, and for certain aspects of an evaluation, more extensive help is available. For example, a Writing Assistant can help craft comments in a performance review, suggesting language to use for employees who require improvement, or who meet or exceed expectations in specific parts of their jobs. You can modify these suggestions, add&#160;further comments, and then click for a Legal Scan of your evaluation, which will highlight inappropriate language--a passage calling&#160;an employee "stupid," for example; that will bring suggestions to be positive instead and recommend how&#160;the employee&#160;can improve. A spelling check is also available. These tools help a manager create a polished performance review, even if he or she lacks good writing skills. It's this type of help that really adds value to SuccessFactors. The service doesn't merely automate paper-based personnel forms; it provides guidance on the entire performance review process. SuccessFactors also helps you set and monitor progress in employee goals. A built-in library of suggested goals can help you set up relevant performance goals for each employee. For example, a salesperson may be required to generate a certain number of leads and increase the customer renewal rate for services. If you keep the service informed of the current state of progress towards meeting goals, it creates color-coded indicators to quickly show whether an employee has completed the goals (blue), is on track (green), falling behind (yellow) or risks failure to meet the goal (red). A dashboard lets you track the tasks you need to do within SuccessFactors and helps you keep an eye on your progress in achieving your employee-management goals. SuccessFactors is available in several editions that are designed to meet the needs of organizations ranging in size from a small business with a few dozen staffers to a large enterprise with more than 20,000 employees. SuccessFactors Professional Edition is aimed at small businesses with up to 500 employees. The company says the average cost is about $100 per user per year, as determined by the number of modules and users. You can sign up for a free trial of the service to see if it's right for your business. The most valuable assets of your business walk out the door every day. Good human resource management can ensure that they'll return tomorrow. Richard Morochove is an IT consultant and writer. Send him questions about using technology in your connected small to mid-size business via e-mail . PC World may edit your query and cannot guarantee that all questions will be answered.